This is great news. If you count the fansubs, this means every TV Special, after this is released, will have good subtitles. Well, that is, besides Italian Game. Awesome news! I've always wanted to see this one, and I was a bit worried that Discotek would work their way through all the specials that were already released by Funimation before getting to this, or that they wouldn't do it at all. Although I do enjoy that they are mostly going in chronological order, it is nice to seem them grab random one's here and there. I wonder why they decided to pick this one up? Great news, will have to pick this up! Great news indeed, i think I remember enjoying this one to some extent. What worries me though is what order they'll go through from here on out. If they'll go Funi/new/funi/new/funi/new etc. If that's the case gonna be quite some time before we see Island of Assassins. Yeah, and I really hope we don't get Nostradamus again. Though I guess if Discotek wants to cash in on Fujiko-service from that spin-off, then it'd make sense to bring back Gemini and/or possibly Columbus Files. Just saw the news, great pick up DT!!!! I don't understand the Nostradamus hate. While not one of the top tier films it is a solid entry and far superior to almost any given TV special and far better than the Gold of Babylon nonsense that everyone clamors for. Also the animation is quite nicely drawn and animated. It's just too hoakey for my tastes. But, yeah, because it has a dub, there's a better chance of it getting rescued than Babylon. On the positive, though, at least Discotek would remove those terrible unskippable trailers which plagued the FUNi discs. Now those DO deserve some hate!!! I did a write-up on the film if you want a better understanding of why it isn't more beloved. I've seen it a few times and while it could be considered a disapointment compared to Cagliostro, Mamo, or DOA I still think it is a solid entry and far superior to nonsense like Babylon, and nearly all the TV specials. Granted as a feature film it might have set expectations too high for some but I still find it far more enjoyable than most of the Lupin I've had to endure. If I remember correctly reading years back (probably in Animerica) this was the film that inspired Monkey Punch to "do it right" and direct one himself? That always left me scratching my head as there was some really crappy content before Nostrodamus that he let slide, not to mention the subsequent TV specials almost rendering the series unwatchable to someone not familiar with the better films. Guess we will just have to agree to disagree, lol. Shin: I have a feeling Monkey Punch did the next one, because TMS was trying to appease fans who: 1)Were missing Yamada and 2)Really hated that special. Notice that was also one of the rare years when you saw two Lupin specials: DOA and Gemini. As for why he stepped aside, it might be the fact that he's not really an anime director. He's done some shorts on his computer, but he's not an industry professional in that area. If I remember correctly reading years back (probably in Animerica) this was the film that inspired Monkey Punch to "do it right" and direct one himself? That always left me scratching my head as there was some really crappy content before Nostrodamus that he let slide, not to mention the subsequent TV specials almost rendering the series unwatchable to someone not familiar with the better films. 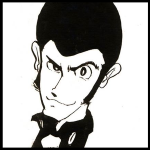 I've always felt that was something that fans came up with to explain his involvement, which makes sense at first, with Lupin's sudden philanthropist tendencies in the movie clashing against Monkey Punch's "Lupin doesn't steal from the rich and give to the poor. That's not cool," philosophy, especially since there's no real reason for it, unlike in, say, Cagliostro. But, like you said, there was much worse Lupin anime out there *cough*Babylon*cough* that didn't seem to bother him as much. However, I think the real reason he directed Dead or Alive is because (if memory serves), the studio couldn't find another director, and (despite being credited a director) Monkey Punch didn't even direct most of the movie, his involvement didn't seem to extend past directing the opening and ending (as well as inspiring the character designs, I suppose), with most of the work being done by the assistant director. As for why he stepped aside, it might be the fact that he's not really an anime director. He's done some shorts on his computer, but he's not an industry professional in that area. Pretty much. Despite not being the main director, he found the experience exhausting and doesn't seem to want to direct any more anime. He's still very passionate about manga (once stating that he'll keep drawing comics until he dies) and eager to try new techniques, but doesn't share the same enthusiasm for making anime.